I read somewhere that Pixar said they were no longer concerned with making good films for kids but are now focused on making good films. That couldn’t be more true with their latest opus. As the first 15 minutes of “Up” are playing out in front of us, I heard a woman talk to her friend next to her and say, “This is way too serious for kids.” She might be right, although I don’t think kids will understand the gravity of what’s going on. But the opening montage shows you one man’s life in 15 minutes and I’d be lying if I didn’t tell you that I had tears pouring down my face from behind my 3D glasses. Don’t worry though, it’s get lite. But Pixar really has evolved to the point where they can get away with stuff like that. I’ve been a HUGE fan of Pixar since “Toy Story.” But their movies have increasingly gotten better and better. They do such a good job of taking adult subjects and packaging it in bright, colorful, funny stories that kids can still enjoy. And they are boldly taking more risks. Can you imagine how the pitch meeting with Disney went for “Up” when they said they want to make a movie with only 5 main characters, virtually zero celebrity voices and the main one is a grump, old man? That alone shows their power. The Disney marketing team must’ve scratched their heads till they bled trying to make toys and costume characters that kids would want to hug on that one. But “Up” captures the human soul so well and will strike a chord with everyone who has ever loved and lost or watched their grandparents go through it. The story gets absurd at times, but you’re totally willing to forgive that since you feel so deeply for the characters. The animation is still a work of art, although the 3D isn’t worth the extra cash at all. Pixar is utterly amazing! They’ve released yet another movie while still keeping their perfect box office and critical success stellar…and they’ve made me desire a dog with a talking dog collar more than anything in the world! The last time Ben Stiller spent the night at the museum it got crapped all over by critics but raked in over a half-billion dollars worldwide. However the second time Stiller gets trapped in the museum…well, nothing much is different. But I’m one of the people who don’t understand why these movies don’t get the love they deserve. Maybe the inner-kid in me is still loving the concept of a whole museum coming to life. When I was a kid and my dad would take me to the museums in Philadelphia, I had that fantasy and would even imagine what that would be like. So to see it in vivid life on the big screen is awesome! I actually found the first one very funny as well as adventurous. But the comedy was definitely punched up for the sequel. When you add gifted comic actors like Hank Azaria, Christopher Guest, and Bill Hader to the already existing comedy team of Stiller, Owen Wilson, Robin Williams, and Steven Coogan; then add the adorable sexiness of Amy Adams…hey, I’m on board! (By the way, Adams is one helluva an actress. I knew that already but she commits to her part in this with the same “moxy” that she does when she’s vying for an Oscar in others.) It’s also fun to sit back and count the cameos that float through like Johah Hill, the cast of The Office, the cast of Reno 911, The Jonas Bros and Eugene Levy’s voice. The fact that the special effects are as plentiful as a Star Wars movie amazes me because with such an expensive production you’d think they wouldn’t allow improv from the actors at all. I’m glad they did though. Some of the improvised scenes between Stiller and Azaria (who steals the show) and the “axis of evil” had me almost in tears. Of course the story is a little absurd. I know it’s a kid’s movie, but the motives for the plot in the sequel are a little bit of a stretch. That being said, I hope they end these movies on this one so we don’t need to imagine a worse plot but as long as they continue to make gobs of money, I’m probably wrong. I recently read the review for this movie in Entertainment Weekly and they said that what’s so perfect about “Coraline” is that it finds an audience in everyone. I would say that they’re wrong and in fact it’s the exact opposite; it may find an audience in no one. This new movie from director Henry Selick (Nightmare Before Christmas) is too childish for adults and way too terrifying for children. But that’s not to say that the movie isn’t great. When I went to see it, I saw it in 3D, which I’m pretty sure is the only way to see it. I can only describe seeing this in a theater in 3D as being a total experience; an event. The fact that it’s stop-motion claymation and is also in 3D makes it feel like you’ve stuck your head inside a moving diorama, like those things you made out of shoeboxes in Elementary School. And the visuals that you see while inside these dioramas are stunning! That aside, the story is also fantastic! It’s gothic and creepy, but still totally appealing to the kid in all of us that dreams of a better world. Of course that was easy to achieve in the movie since the book, by Neil Gaiman, has already been such a success. 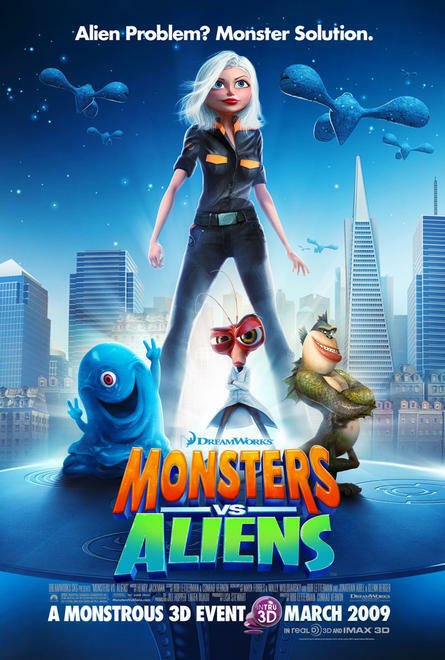 The acting was good too from the voices of Dakota Fanning and Teri Hatcher. 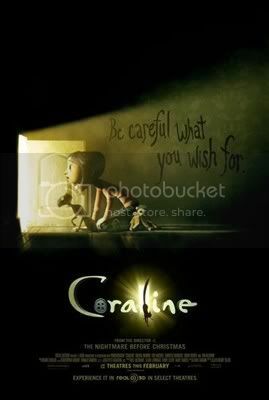 The only flaw in “Coraline” was the script. It was written for the screen by Selick and the dialogue verged on downright idiotic…even for a kid’s movie. Because of that, the movie feels every second of it’s 101 minute runtime. However, I can forgive the script being so bad since you spend much of the time getting lost in the consuming worlds of the film. But be warned that those worlds are probably too scary for most young kids out there.